Sports Trips has everything you need to build and customize your own UCLA Bruins Men’s Basketball travel package. Experience College Basketball with the greatest fans on the west coast. Nothing beats a Bruins game! Sports Trips is your number one resource for all your UCLA Bruins tickets, flights, and hotels. Start booking your trip now! Enjoy Premiere seats, hospitality and many more. Watch the UCLA Bruins play live. Get your Bruins Men’s Basketball tickets today! 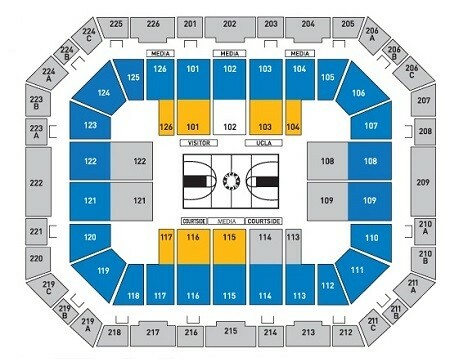 Planning your UCLA Bruins Basketball Trip? Here is where you are going to find the best UCLA Bruins travel deals so you can make your budget stretch out as far as possible. Whether you love American Airlines or can’t get enough of Southwest, we’ll help you find air travel deals for away games or traveling to LAX! We provide you with hotels that are just a walking distance from Pauley Pavillion and most College Venues. Sports Trips provides comprehensive Travel Packages both domestically and internationally. Book now and get great rates for all College Basketball destinations with VIP, premiere, general admission tickets, flights, and hotels. Book and build your customized UCLA Bruins Men’s Basketball travel packages today for a remarkable price. Are you making restaurant reservations? Would you like to do it the easy way? OpenTable makes it easy to make restaurant reservations the easy way. Beat the crowd and make your reservations in Los Angeles now. Read reviews, explore menus & photos. Make Los Angeles restaurant reservations & find the perfect spot for your Bruins Game Day weekend. OpenTable to make your reservations today! The closest major airport to UCLA is the Los Angeles International Airport, LAX. From LAX, take the 405 Freeway north to the Wilshire Blvd. East exit. Continue east on Wilshire for several blocks, moving into the left lane. Make a left turn on Westwood Blvd. and follow it into campus. UCLA’s main campus is bounded by Sunset Blvd. on the north and Le Conte Ave. on the south; the east border is Hilgard Ave. and the west border is Gayley Ave.
Sports Trips has up to the minute UCLA Bruins Basketball Tickets, Flights, and Hotel Information. Start planning your trip Today!